Here we have a Left 4 Dead 2 review by xbox forum member, Shaunyowns. Last year Left 4 Dead burst onto the scene giving you the opportunity to be a zombie or fight against them the only problem was it didn’t have enough content brought to the game. In Left 4 dead 2 this problem seems to be resolved as there are now 5 different game modes spread across 5 campaigns. 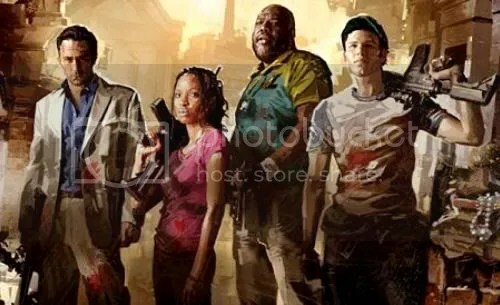 The Left 4 Dead 2 campaign takes you to the Deep South from Savannah, Georgia all the way to New Orleans. Each level has there own unique design as one campaign (Hard rain) has a powerful thunderstorm come down on you as you prepare to escape. The new survivors are livelier and Ellis’ stories about his friend Keith lighten the mood and are bound to make you laugh. There is a new crop of guns appearing in the game including Grenade Launchers + multiple versions of the Pistol, Shotguns, Assault Rifles + SMG’s. The best standout addition to the game is the melee weapons they take the place of your secondary weapons. Melee weapons such as a fire axe, Baseball bat + Katana are just a few of them each designed to decapitate your enemies. Your melee weapons are able to just about cut anything off a common zombie. Some of the ‘uncommon common’ take more damage in the game, like the ones in the hazmat suits or the swamp mudmen again adding more variety. With the new additions comes new items Adrenaline shots give you a slight health boost and increase the speed of which you run they also allow you to heal your teammates faster. Defibrillator pads allow you to bring survivors back from the dead and the incendiary and explosive ammo packs make your life easier. The last item is the Boomer bile which if you throw onto a tank you’ll get a lot of help from the infected to injure him. There are 2 final modes which round out the package. Survival which was introduced in the Left 4 Dead downloadable content is like playing a finale where no rescue ever comes you fight against waves after waves of infected and earn medals and leaderboard rankings for your trouble. Although it comes a year after the original Left 4 Dead 2 has new campaigns, unique game modes which offer a lot more variety and longevity while all the tweaks from the previous game make the experience more enjoyable. The new features make this zombie apocalypse impossible to miss.